You can use JumpCloud® policies to manage systems in your organization. Policies are set in JumpCloud’s Admin Portal and require no coding experience. After policies are configured, admins can deploy them to groups of systems and monitor the status of each machine. Go here for a list and description of JumpCloud's policies. You must have active systems running on a supported OS to create system policies. See our System Getting Started Guide before you get started with policies. You must have defined system groups to create policies. See Getting Started: Groups. As part of the system agent check-in process, policies on an individual system continuously compare their configuration with the version in JumpCloud. If a user modifies their system configuration, JumpCloud automatically modifies the system configuration to comply with the with the JumpCloud policy. For systems that are connected to groups with conflicting policies, the policy that was applied first is the policy enforced. If the JumpCloud agent for a system is out-of-date, JumpCloud may be prevented from enforcing all policies on that system. For Windows® systems, only English (United States) has been qualified. Additional language packs are not currently supported. Windows Home is NOT supported. Click ( + ), then select the OS you want to add a policy for. You can add Mac®, Windows®, and Linux® policies. Select a policy from the list, then click configure. On the New Policy panel, optionally enter a new name for the policy, or keep the default policy name. Policy Names must be unique. 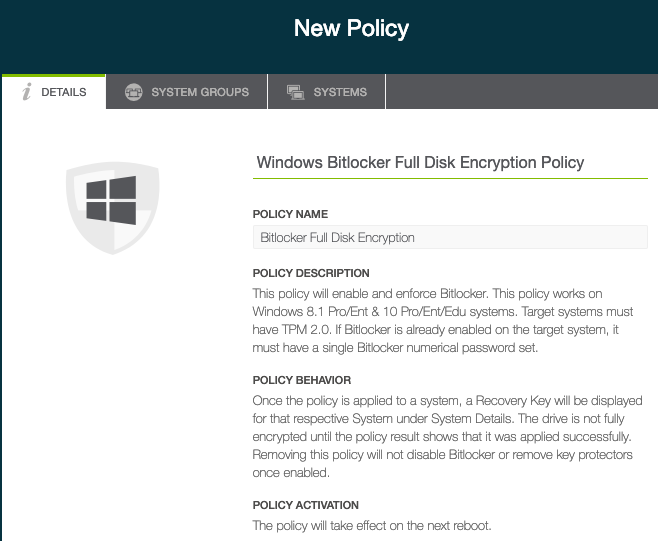 The Policy description describes the policy's function and lists the specific OS versions supported. There may be activation steps and additional required settings explained in the policy's details. Click the System Groups tab. Optionally, select one or more system groups to apply this policy to. 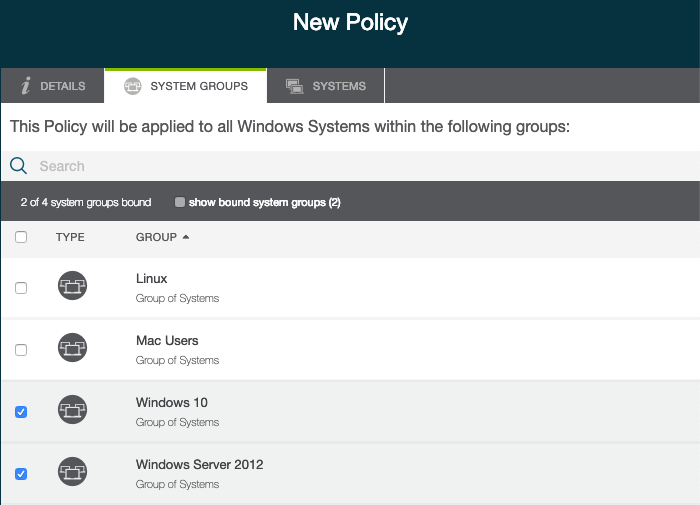 For system groups with multiple OS member types, the policy is applied only to the supported OS. Click save policy. After you save, the policy takes effect on active systems in the selected groups in around 60 seconds. Any inactive systems get the policy the next time they next become active. After the policy is created, it can be applied to groups from the Policy Details panel System Groups tab as previously described, or from the Group Details panel Policies tab. When a policy is deployed, it may take a few minutes for the policy to be enforced on the system. After the policy runs on the device, you can view its status to determine if the policy has been successfully applied, or if it requires additional attention. To view the status, click the Policy Details panel Status tab. Click view to see the last Result Log for a given system in the list. You can also view the policy's status from the System Details panel Policies tab. Find more information about policies in the JumpCloud Agent section of the our Knowledge Base.